Each month we collect a specific type of food or product, based on the current needs of our local Food Banks. It’s a great way for us to remember those in need throughout the year, and show them we care! 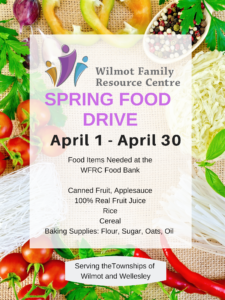 Wilmot Family Resource Centre 2019 Spring Food Drive.